A charming villa accommodating up to 8 guests, peacefully located amid an avocado grove, 5min to Coin and 25mins from Marbella, Puerto Banus and the sea.The villa is in excellent order throughout. Upstairs, the villa has 1 double bedroom leading out to large sun terrace/balcony and 2 twin bedrooms. There is a bathroom with shower and WC upstairs and a separate shower and WC downstairs.There is an annexe attached to the main house with separate outside access. In the annexe there is a twin bedroom with a large ensuite shower room. The kitchen is fully fitted with hob, oven and microwave and two large fridges.The spacious sitting room is comfortably furnished with smartTV with Freeview, DVD player, unlimited wifi available. Dining table indoors as well as a large outdoor shaded eating area.Private 4 x 6.5m pool with outdoor shower and outdoor kitchen/barbecue.Landscaped gardens including a variety of fruit trees and grapevines.Magnificent views across the valley. Price includes linen hire and departure clean, no hidden costs. Skiing in the Sierra Nevada: Finca Tropical is located within reach of the Sierra Nevada. Within 2 to 3 hours drive you could be skiing down the slopes of the highest mountains in Spain. A fascinating break from the drudgery of the pool or golf course! Highly recommended. I am a doctor specialising in back pain and sports injuries. I have been married for 26 years to Kate who organises the bookings for our villa and we have three teenage children. Finca Tropical is quiet and secluded for a relaxing holiday, but is only a few minutes away from the shops, bars and cinema in Coin. 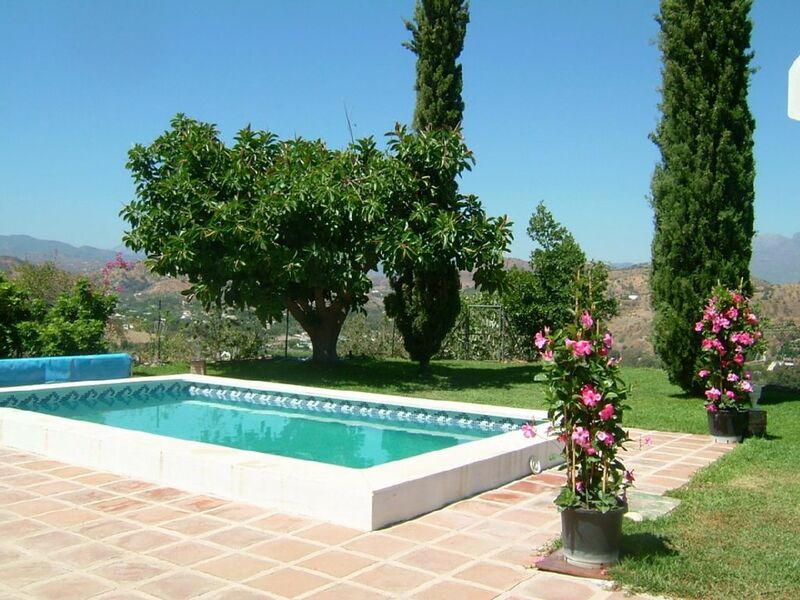 The views are stunning and the garden is big enough for the famous Finca Olympics which includes events such as Avocado and Spoon racing and tug of war over the swimming pool - losers get a dunking! Finca Tropical has a large enclosed garden, private pool and outdoor barbecue area. The views are stunning and the town is very pretty and traditional with lots of tapas bars. There is a Fiesta every August with parades and outdoor bars and everyone parading around in their traditional Spanish costume. Please bring your own beach towels for use by the pool. The washing machine is in the garage. There is a washing line at the rear of the property and the clothes dry very quickly in the summer heat. This is available for storage and is where the washing machine and freezer are located. Towels provided with the the linen pack for £12 per person. Please bring your own towels for use around the pool or at the beach. Thank you. There are three sofas and a dining table and chairs in the living room. The dishwasher holds 10 place settings. Two large fridges in the kitchen and a fridge plus freezer in the garage means there is masses of space for storing food and drink meaning less trips to the supermarket and more time for sunbathing! The freezer is in the garage. The hob is a gas hob. It does require matches to light. The oven is an electric oven with a grill facility. The microwave is 850 watts. There are ample dishes and utensils. There is an indoor dining area with 6 chairs. There is an outdoor shaded dining area for 8 people at least. There is quite a number of English books to read. There are some board games available. The garden has some fruit trees, lawn area and plenty of space for outdoor games. There is a large balcony leading out from the master bedroom with amazing views. There is an outdoor kitchen with a large charcoal barbecue area with chimney and a sink with running water for food preparation. There is a large terraced area around the pool, with sun loungers. There is a golf course in Al Haurin only 10 minutes away and more than 20 golf courses within forty five minutes drive. Air conditioning in all bedrooms and living room. Unlimited Wifi, Smart TV with British channels and thousands of movies to choose from. Cot, highchair on request (at small additional cost). Fully equipped kitchen, with dishwasher, decent cutlery and crockery, not your usual rental bendy forks! Huge 1st floor balcony, views to match. Villa Maria nearby for larger groups, to holiday together but retain independence, and sanity! See Villa Maria Property no.7539. Our stay was great. The spot is lovely (views!) and the location perfect; you can reach everything easily by car. Very good possibilities for hikes in the mountains. The house is very nice, for good and bad weather. The heated pool is great! One little downside is that the fourth bedroom can only reached from outside the house. For some things in the house (e.g. electricity, pool heating) we needed some help, which was provided immediately; The service was perfect. This gave a very good feeling. So, excellent holiday, very recommendable! Coin is an attractive, unspoilt Andalusian 'white' town about 25 minutes drive inland from the coast. It has all amenities including a good variety of shops, bars, restaurants etc., and a large hypermarket. The villa enjoys a semi rural location peacefully located on a hillside about 5 minutes by car, out of town. Finca Tropical is 25 minutes drive from Puerto Banus, Marbella and the sea. There is a small local shop for every day essentials about 15 minutes stroll from the Villa. Clay pigeon shooting, horse riding/trekking, rifle shooting, quad bikes, go-karting, cycling, wolf park, fishing, beautiful walks and nearby lakes, tennis/country club are all activities to be found within easy reach of the villa. Finca Tropical is located in a peaceful, semi-rural position well away from the hustle and bustle of the town. Wonderfully safe for children.